Homemade body scrubs can be prepared easily and therefore, you need not worry when it comes to exfoliating. Who said you have to go to the cosmetic store and spend a hefty amount to get hold of a good quality body scrub? Make it at home conveniently with kitchen ingredients. Generally made out of natural constituents, these scrubs are very gentle. They are free from harmful chemicals as well. Not only are these scrubs efficient in rejuvenating your skin, they are also cost effective options for you. Why Make Your Own Homemade Body Scrub? Making your own homemade body scrub allows you the freedom to create the right recipe customized according to your skin type. This is an inexpensive way to offer the finest treatment to your body. You can mix ingredients from your own kitchen and attain the perfect combination which is best suited to the needs of your body. 1. Red Lentil Body Scrub: Take some split red lentils (commonly known as ‘masoor dal’ in Indian households) and grind them. Mix this powder with rose water and honey. Use it as a body scrub to maintain healthy skin in summers. 2. Yoghurt-Coffee Moisturizing Body Scrub: Lightly ground coffee powder (one cup) is to be mixed with fresh yoghurt (1/2 cup). Massage your body with this paste in circular motions. It is helpful in making your skin soft and even. The best part of using this scrub is that you need not moisturize after using this scrub. 3. Tomato-Rice Body Scrub (for oily skin): Some uncooked rice (known as ‘chawal’ to Indians) should be soaked in water for about thirty minutes. Grind the rice coarsely. Make the puree of some tomatoes and add the rice particles in it. Apply the mixture on your body and let it remain for twenty minutes or so. Wash off with warm water using circular motions. This extremely good for you if you have an oily or combination skin. 4. 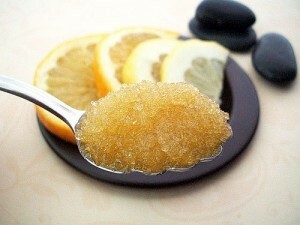 Honey-Sugar Body Scrub (for dry skin): Take four spoons of sugar and soak it in honey. Make sure that the sugar does not melt. Add two spoons of olive oil. Scrub your body with this mixture. While scrubbing, if you find that the sugar melts, keep adding sugar till you finish scrubbing. Honey is an excellent humectant and promotes moisture retention; olive oil too adds to the moisture content and thus, this scrub works wonders for you if you have a dry skin. 5. Yellow Lentil-Milk Scrub (for sensitive skin): Soak half cup of yellow lentils (commonly known as ‘arhar’/ “tuvar’ dal in India) in water for thirty minutes. Make a paste and add milk in it. A spoon of chickpea powder (chickpea is generally known as ‘kabuli chana’, ‘kala chana’ and ‘hara chana’ and is easily available in Indian kitchens) and mix till it becomes a thick paste. Use it as a scrub and this skincare recipe is known to be good for sensitive skin types. 1. Body scrubs help in opening your skin pores, cleansing them thoroughly and promoting blood circulation throughout the body. 2. Scrubs comprising coffee can be useful in fighting cellulite. 3. Since your dead cells are removed, your smoother and healthy-looking skin is revealed naturally. 4. Body scrubs should be used not more than two times in a week; even homemade body scrubs can damage your skin if you scrub it too frequently. 5. Body scrubs must be applied when your skin is moist and there is no need to use soap after scrubbing your body. Wonderful tips Somreeta 🙂 Love your articles!